There has been a public house on this site since at least the 1870s. In 1875 James Dewar occupied the premises, he was well established, having premises on Commerce Street, New City Road, Port Dundas Road, West Russell Street and Duke Street. Three years later John Campbell took over the licence, he went on to own another public house at 297-99 Hope Street the Glen Afton. 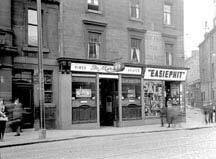 The Campbell family continued to run this pub before the First World War, Patrick Griffin then took over the pub, however Mr Campbell continued in his other premises at the top end on Hope Street. Mr John Campbell the licensee died in 1936. Another well known city publican to own this old pub was Peter McCabe, he continued as licensee until the 1960s when the pub was demolished. The City Council had plans for the Cowcaddens in their redevelopment scheme. Peter McCabe's family were well known in the Scottish Licensed Trade. See Jarvey's Inn. Mr & Mrs Peter McCabe, Mrs & Mr J McCabe, at the friends wedding reception 1960. Standing Mr Peter McCabe, Mr W McIvor, John Walker & Sons Ltd., Mrs P McCabe and Mr D D Rennie, Booth's Gin. Seated Mr & Mrs J McCabe. 1962.